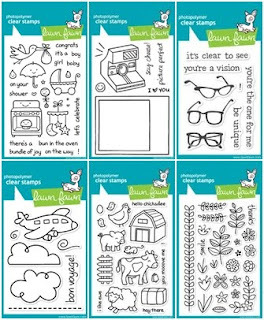 What it is: Lawn Fawn, one of the newest companies on the stamping block(pun intended...har har), has just released 9 new sets of high quality photo-polymer clear stamps this spring. This brings their collection to 45 sets in just a little over a year! I have to say that I am highly impressed! That's quite a collection to choose from. But how COULD you choose? They are all so cute! I would be lying if I told you that I wasn't over-the-moon excited when I received these adorable stamps. The images are too sweet, and the sentiments are just so clever. I received the "Clear to See", "Plus One", and the "Say Cheese"(top 3 sets pictured above) sets to work with, and let me tell you, I had a BLAST working with them, so much so, that I made way more projects than I needed to complete my review! 1. The sentiments are mix-and-matchable for many of the sets. For example: in the "Plus One" set, you could come up with a ton of different sentiment phrases for pregnancy and birth announcements, congratulations cards for boy or girl, and even shower invitations. 2. The stamps create a nice clean image when stamping, and they're clear, so you can see just where you're stamping. 3. Lawn Fawn stamp images are fun and quirky. I especially love the happy little faces they add to many of the images. What I didn't like: I am honestly trying to come up with something I didn't like about these stamps, and I am coming up blank. I really enjoyed using them and I can see myself reaching for them over and over again. What I think: I truly LOVE these stamps! They stamp cleanly, they're adorable, and sturdy. I will be using them over and over! What do YOU think? Do you own and Lawn Fawn stamps? What do you think about them? If not, will you be trying them out, now? Leave a comment by midnight EST Tuesday to be entered to win a Lawn Fawn set! These look really cute. Love the eye glass stamp! What fun! I love the whimsical style of Lawn Fawn stamps. I really really want to get my hands on the polariod stamp sets. I haven't seen these yet, but they look super cute! I definitely want to give these guys a try! Super cute sets!! Would love to win a set! Thanks! I own one set of Lawn Fawn stamps, and I love them! They are very good quality and stamp very cleanly. The thing that impressed me most about this company though, was their customer service. I contacted them, needing this stamp set immediately for some invites I was making, and the not only responded back ASAP, but they sent them out THAT DAY!!! I will forever buy from Lawn Fawn because of that! Oh my, LOVE your card. The eye glas stamp is just so adorable. I don't own any LF stamps but I sure have been wanting that 'polaroid' stamp since its release. There are on my Wish List. Thanks for the chance to win! Very cute! Love the "Say Cheese" and the "Clear To See" stamps especially. I've been seeing lots of great blog posts about Lawn Fawn... I guess I need to check them out. These stamps are so sweet! I love the line-drawing style and the cute images. Thanks for the chance to win some! I've been watching Lawn Fawn as a company and REALLY like their products. I can't wait to get my hands on some of their stamps! I love Lawn fawn! Have tried them, but dont own any yet. They are definately on the wish list! thea are sooo cute! I really like them! Have been wanting the "say cheese" set for months. Hopefully soon! I have not yet tried their stamps, but I do love the images they have available! Super cute projects! i don't own any of their stamps but boy are they cute! These are such cute projects! I haven't tried these stamps yet, but I'd love to. Thanks for the chance! I just recently found Lawn Fawn and I love love love their stamps!! I've already purchased several of them but I still have several on my wish list!! Love Lawn Fawn stamps!! Great samples in this post! Exactly, there are no negatives about Lawn Fawn stamps. Oh, maybe that we can't all afford to have every single Lawn Fawn set, so we have to somehow choose? Nah, it's all positive. I love LF stamps. I need all the new ones. Cute. I have lots of Lawn Fawn stamps and I love how they make the cutest cards ever and that they make great impressions every time. They're super easy to use. Thanks for a chance to win! Heck yea i love these stamps. So much so, I created a very successful challenge blog called Lawnscaping in honor of Lawn Fawn stamps! I, too, can find no flaw! They are fun and quirky and Kelly is super sweet! A great combination in my book! I do truly LOVE my lawn fawn stamps! They are my most favorite and most used stamps in my collection. They are the first stamp company I have found that is completely my style. They are perfect for coloring and paper piecing and make the cutest projects ever! These stamps are cute. I like your be unique card. great idea. Lawn Fawn's polaroid stamp is my favorite! I just wish I owned more, they are beautiful. now, i'm a COLLECTOR of Lawn Fawn! lol, i LUUUUV them! esp. Critter series! :-) They are so versatile, and i can make a card, not only from one set, but also from their different stamp sets :-) . I don't own any but would love to get my hands on those. Unfortunately, shipping costs more than the actual stamps and that's what's keeping me away from buying those. I would definitely try those if my LSS had them! I absolutely L-O-V-E these stamps. The little critters collection is my favorite! I got into stamping around the same time the company was launched. I would honestly but them all if I could!!! I couldn't resist the cuteness of their spring release - I bought my first few sets. I love them! They are so easy to use - and fun! These are such adorable cards!! Lawn Fawn has some super cute stamps....I NEED to get some!!! I own a few lawn fawn stamp sets and I wish I owned more.They are fantastic and soo cute:) I will continue to buy them. I am also a Lawn Fawn fan!! I own a lot of sets and can't get enough of them :-) They are so super cute!! Lawn Fawn stamps are awesome. I own several sets, they stamp great, the images are adorable, you just can't go wrong! I have been hearing good things about LawnFawn, hope to get my hands on some soon to try for myself. Lawn Fawn is fast becoming one of my Fav. companies not only are the stamps so much fun & you can do so much w/them but Kelly Marie is the most sweetest of the sweets. She is so funny & her friendliness is just so wonderful. Thanks for the chance! I think Lawn Fawn stamps are ADORABLE! And I would own them all if I weren't an out of work teacher and could afford them. I love how so many of the images are 'happy', just so sweet. Thanks for the chance to win some!! I have not tried Lawn Fawn stamps, but I would love to! Their designs look sweet! They are small, lovely and cute- I just love the sentiments a lot!! The Be unique card is a treasure! 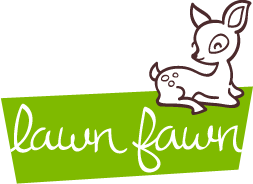 I am new to Lawn Fawn too. I have not used them, but I would love to try them out!!! super cute cards and stamps! I really want to try that Plus One set! I have 8 lawn fawn sets now and love them. They are so cute and versatile! Thanks for the chance to win. Kelly Marie and her success with Lawn Fawn is so inspiring!! I only have a couple of sets - but the sets I do have I just love. I love everything about Lawn Fawn and what it represents! This fast growing company rocks! I love the cards you made with these stamps as well Mandy!! I think lawn fawn stamps are adorable. I just love Lawn Fawn! I was hesitant to get them at first but oh my goodness..I adore my lawn fawn sets. They are by far the best clear stamps out there. It's a perfect impression every single time starting with the first use. Their alphabets stamps are set up to work together unlike most other company's stamps. All the sets are interchangeable which is, I think the best part. I could go on and on.. get a set, you won't regret it. I haven't seen this brand (Lawn Fawn) anywhere but on the internet so far. Love the simple and sweet artistry of the stamps designs. I'm a big Lawn Fawn fan. I've collected a few sets so far and not only do they corner the "adorable" market but the stamps produce great images time after time. I LOVE the fonts they use but my favorite is the handwriting used for many of their sentiments. You know that you can curve the sentiments as well, right? Just a wonderful company! I love the designs of Lawn Fawn stamps but have not gotten any YET. I haven't seen them in my LSS but I did request that they get some. I LOVE Lawn Fawn's designs!! They have great stamps!! I love lawn fawn, and I met the people behind the stamps, and they're so sweet. I have the polaroid set, and it's just so darn versatile! These stamps and your projects are pure cuteness! Love the say cheese set! I don't owj wny lawn fawn cuteness, but i would love to! I own 4 Lawn Fawn sets and love them all. The images are totally adorable and the corresponding sentiments make me smile. The stamps are very easy to work with and give a nice, clear impression. The company's customer service is top notch too. I ordered on a Friday morning, I received an email of shipment confirmation that afternoon, and received my order the next Monday - and I live across the U.S. from them! They also included a handwritten, personalized thank you note and a "thanks" stamp. What else can I say? I ♥ Lawn Fawn! I do not own any Lawn Fawn stamp sets yet but I definitely would like to get some soon. Thanks for the chance to win. I own a few Lawn Fawn sets and I agree…they are wonderful! They stamp beautifully and their sentiments coordinate beautifully. Thank you for the opportunity to win some new sets. I don't own any of these stamps yet but every review I've seen has been wonderful. I really like the set with the polaroid image. I can think of lots of ways to use that one. I love the few lawn fawn sets I own! They stamp perfectly and are very versatile. I don't have any of the new releases but they look awesome! I love Lawn Fawn stamps, their stamps are adorable and their super nice quality. I only have a few sets but can't wait to get more! Great job with the cards, Mandy! Love what I've seen of Lawn Fawn - especially the Say Cheese set! Thanks for the great review. Love love lawn fawn stamps, own several sets, still want more and only $5 S&H to Canada :-) great customer service , fantastic product can't wait to own them all! I lurve Lawn Fawn! Hands down my favorite stamp company. Cuteness and witty puns are always a plus in my book. I love the cards you made! So cute! I haven't seen any personally but I would love to win these! Great job with your samples!!! I love Lawn Fawn stamps. They stamp so well and are so versatile. They are the stamps I always reach for first now. Just too cute!! I've have a few sets and they're pure love. They stamp beautifully as well. Thanks for the chance to win. Love the baby set I have. I want more!!! Oh, these stamp sets are so cute. I don't have any Fawn Lawn stamps, but I would love to own a set, so that I could enter challenges requesting Fawn Lawn stamp images. The farm animal one is so cute. Thanks for sharing. I have never tried them, but would really love to win! I have not tried Lawn Fawn stamps yet-I have been seeing them on a lot of creations and they look like great fun-would love to try them! Have only recently seen Lawn Fawn stamps (on several blogs) but love their designs. They look great for coloring...and I LOVE the set with the glasses! I don't own any yet, but they are absolutely adorable and on my wish list. Maybe I'll win! I love Lawn Fawn stamps! I do especially love the cute little Smiley faces that appear on many of the stamps. I do not have any of them yet, but they are definitely high on my wjish list. I love Lawn Fawn stamps and have several sets. They are adorable, of great quality, stamp cleanly, and the images are easy to hand-color with Copics, pencils, watercolor, etc. I just love them! Would love to win more! I love Lawn Fawn and have been using them almost a year. They DO stamp very cleanly and are so durable. I love that they allow patterns to show through or can be customized for my project by coloring. My first set was Harold's ABC, which I have used on many projects. LF's alphas are a must have. LF puts extra letters in the alpha set to allow the stamper to make his/her own words easily! ACK! Great review Mandy! I have 19Lawn Fawn sets & ADORE every one - I tried to guestimate how many sets I had... was gunna go with 9... then I actually counted how many I have and was surprised!! I'd have more (many more) if my budget permitted! The quality is excelent and they are just so fun and whimsical!!! I use them ALL the time! On my list of "to buy" are Critters in the Forest (I honestly do not know how I've restrained my self for THIS long!! ), Smitty's ABCs, On the Mend, Admit One (!! ), and the Bon Voyage ;). Thanks for the chance to win some :D.
Lawn Fawn has the cutest stamps I've ever seen. I love that card with the glasses on it (Be Unique). Currently I don't have any Lawn Fawn stamps. I've gotten really careful about buying clear stamps-I have several sets that aren't worth using.But I like your comment that says the stamp cleanly so I'm going to give them a try.They have several sets I think are fantastic. I just love how FUN these stamps are! You just smile looking at them in their package. Heard about them but haven't yet tried them, but would love to. They r cute,especially liked the Polaroid one! I have never heard about this company before. very cute stamps. love the sunglasses card you made. I think these stamps are adorable too. I don't have any yet but would love to start playing with some. Lawn Fawn stamps are so cute!